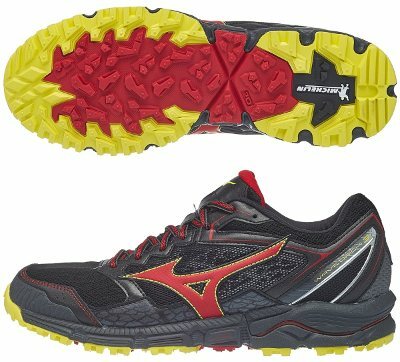 Mizuno Wave Daichi 3 are neutral trail running shoes. Not many changes in versatile Mizuno Wave Daichi 3 which keeps what was working fine in older editions and features minor updates in upper to improve performance. Within trail running lineup from japanese brand, the Wave Daichi 3 holds an intermediate position between lighter, more responsive Wave Hayate 4 and heavier Wave Mujin 4, plenty of choices to gain some market share. Although upper is pretty similar to its predecessor Wave Daichi 2, there are few details that unveil enhancements introduced in current third edition: toe cap has been reinforced to improve protection and along with side panels, whose configuration has been carefully designed to avoid issues in flex area between fore and midfoot to increase durability. It remains the well padded tongue which is partly gusseted to both sides to avoid not only debris and dust from jumping inside but also too much freedom of movement or undesired slippage. Rest of Wave Daichi 2 remains the same (including 12 mm drop) emphasizing the superb outsole made in collaboration with renowned french tyre manufacturer Michelin with great flex area in midfoot (Xta Groove) delivering extra flexibility for uneven ground adaptation. Midsole is typical Mizuno one and offers reliable cushioning based on well known AP+ foam combined with concave Wave™ and innovative U4icX™ under the heel to improve comfort with softer sock absorption. It performs well, so there is no need to change.